The REAL Soldiers Lay Down Their Arms as Soon as They Can . Emmanuel Jal is one of the hottest rappers in Africa, and Abdel Gadir Salim is an extremely prominent singer and oud player. They are both from Sudan, Africa's largest country, but this collaboration would have been absolutely unthinkable until very recently. This is because Salim is a Muslim from Sudan's north, while Jal, a Christian, is from Sudan's rebel-controlled south. Jal was drafted into the SPLA rebel army when he was only seven years old; with the help of aid workers, he managed to escape to Kenya, where he found his muse in a form of "gospel rap" -- but until the historic peace treaty signed between the government and the SPLA this summer, guerrilla raids were still commonplace in this wartorn land, and you'd have to be a fool to believe that everything is fine in Sudan. But the main reason Ceasefire cooks is because both men are virtuosos in completely different styles. You can hear this because they are not both on every track. Jal tracks like "Aiwa" and "Gua" are African-derived, but they are definitely hip-hop, with his nimble freestyling all over the top; Salim tracks are a lot more melodic and Arabic, with tricky instrumental passages and passionate singing. As talented as the two are individually (Jal gets three solo songs, Salim gets two), it is the other collaborative half of the album's tracks that is the most exciting. Salim's song "Hadiya" is intricate and bubbly, a perfect rhythm that becomes more perfect when Jal's relaxed flow breaks into it halfway through. In the same way, Jal's "Nyambol" (a tale about a girl who is rescued from a terrifying childhood by aid workers, virtually Jal's own story) becomes deeper and tougher with Salim's soulful singing and oud lines. "Asabi", the closing track which is the only one co-written by the two, is Arabic and African and hip-hop and rock and every music in one, the sound of joy crystalized into musical form. There is so much beauty here that it is hard to describe it in words. It is a low-key and guarded sort of beauty, but it is no less beautiful for all that. 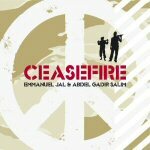 Ceasefire is the sound of two men collaborating on a musical project, but it is not too much of a stretch to say that it is also two halves of a divided nation just now learning to trust each other. I'll be listening to this disc every time I read more about Sudan and its struggle toward peace and freedom... or when I just want to hear some damned good fun music that is often about very serious subjects.